I was supposed to write a movie review of “Rogue One: A Star Wars Story”. 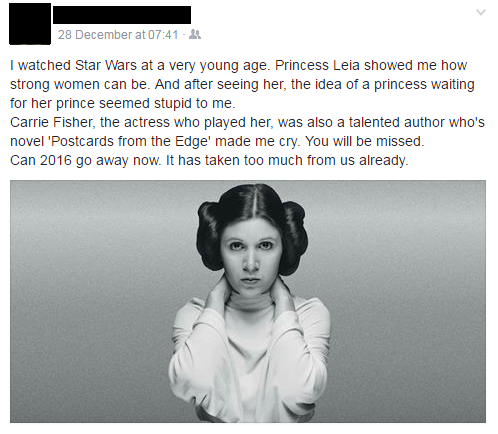 However, the sudden death of Carrie Fisher, who is known as Princess Leia Organa in the Star Wars saga, changed my mind. She died at 60 years old, after suffering from a heart attack four days ago on a flight. 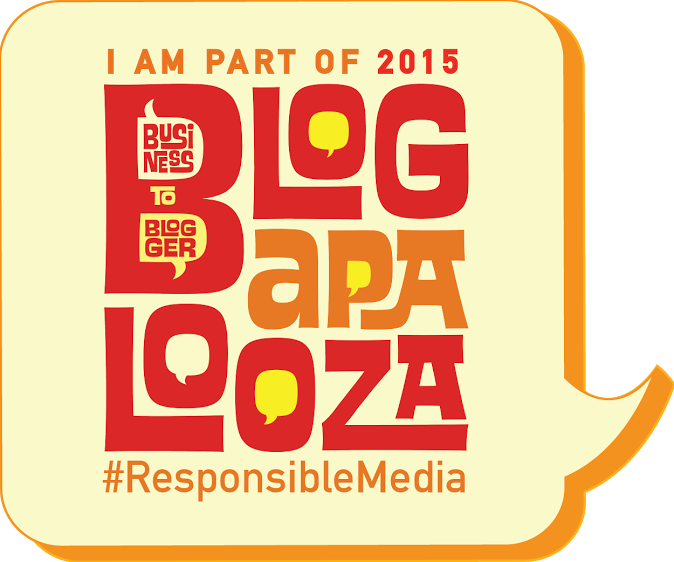 I decided to pay tribute to her with a simple but meaningful blog post. Thanks to my father, Star Wars became a part of my growing up. 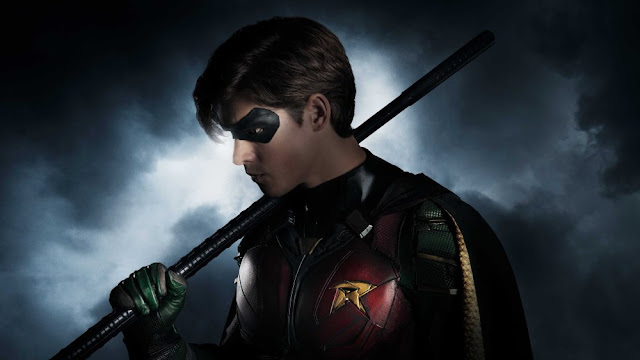 He exposed me to the fandom when I was just a kid. That time, Lucasfilm remastered the Original Trilogy and released them in theaters. In 1997, my dad brought me to the cinema to watch a remastered “A New Hope”. Soon after, we also watched “Empire Strikes Back” and “Return of the Jedi”. Thus began my love for Star Wars. Despite being a naive kid, I became fascinated with this new world that was filled with different stories and lovable characters. 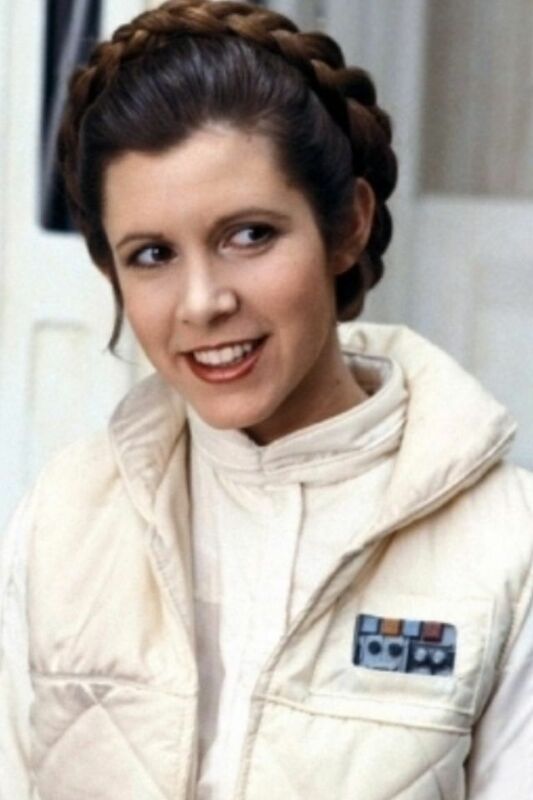 One of the characters that really stuck to me was Princess Leia Organa. 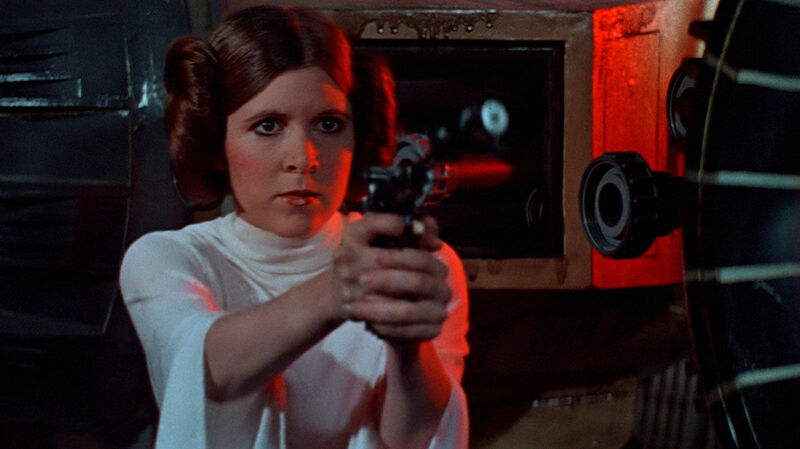 At a time when princesses were about Snow White, Sleeping Beauty, Ariel, and Cinderella who all waited for princes to rescue them, seeing Princess Leia in the big screen was very fresh and new. 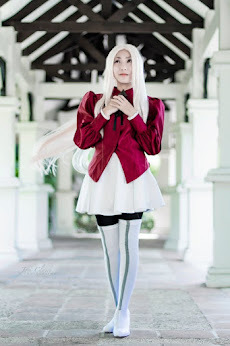 She is not your typical princess who just waits for her prince to rescue her. She is the princess who is strong, powerful, brave, and independent. 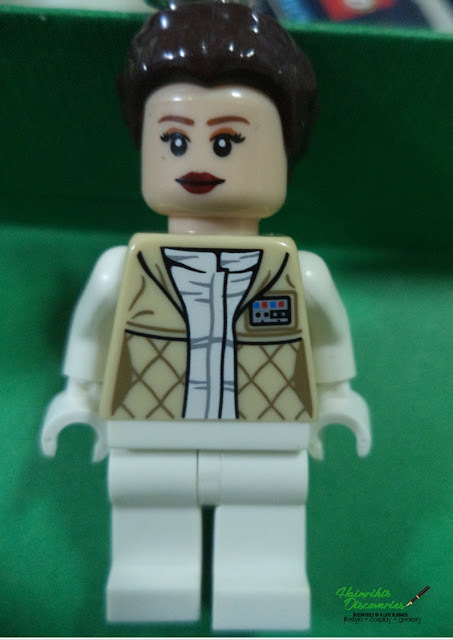 Leia always fights for what is right and shows everyone that she is a great leader on her own. Yes, Leia is a princess---but a princess who commands the Rebel Alliance and leads everyone into fighting the Empire without hesitation. In the 90s, that’s something you don’t see every day. For Leia, she can do everything on her own and fight the enemy with her intelligence, wit, and bravery. In fact, when I watched “A New Hope”, one of the scenes I remembered was when Leia, Han, and Luke were trapped because Stormtroopers were firing at them. She took Luke’s rifle and said, “This is some rescue. You came in here, didn't you have a plan for getting out?” As I said, not your typical princess. That scene made me love Leia even more. 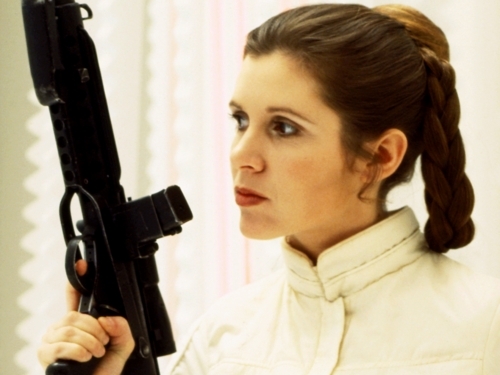 Of course, Princess Leia wouldn’t be known if not for the talented and witty Carrie Fisher. Because of her wonderful portrayal, Fisher became a household name in the 70s. 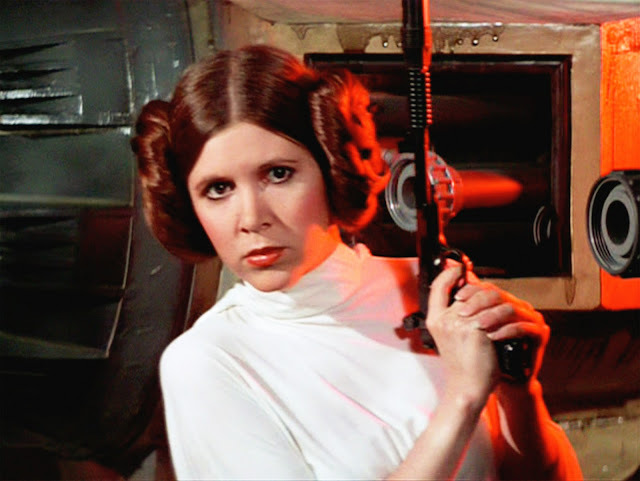 Even if she had other roles after Star Wars, her role as Princess Leia stuck to me until today. 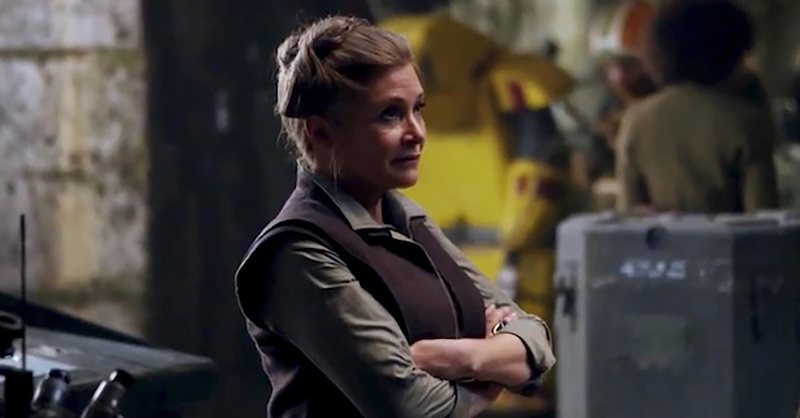 Which is why I was very happy that Carrie revisited the role again for “Star Wars: The Force Awakens”. 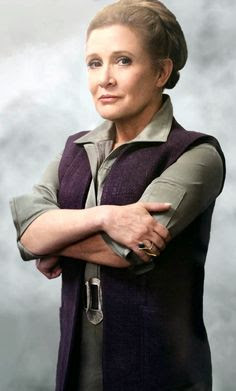 Yes, She was old, but she still portrayed the same strong and powerful Leia by becoming General Leia Organa of the Resistance. 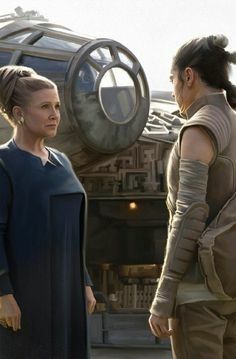 Despite having to go through various hardships, losing his family, losing his son to the dark side, and still fighting an enemy that refuses to be defeated, she didn’t give up. Instead, she stood, led the Resistance, and showed everyone that she is a force to be reckoned with. In fact, now that I look at General Leia Organa, I also see Carrie’s life. She struggled with drug abuse, mental illness, and the consequences of fame and fortune. Despite the struggles, Carrie never gave up and faced her obstacles head on. She also retained her wit and brought out a lot of courage in poking fun about Hollywood. Overall, both Carrie Fisher and Leia Organa almost share the same qualities. It’s no wonder many people loved Carrie. She fought for what is right and is a true feminist in her own sense. Throughout the years, a lot of young girls and women looked up to her for qualities, and I am one of them. Carrie Fisher will surely be missed. 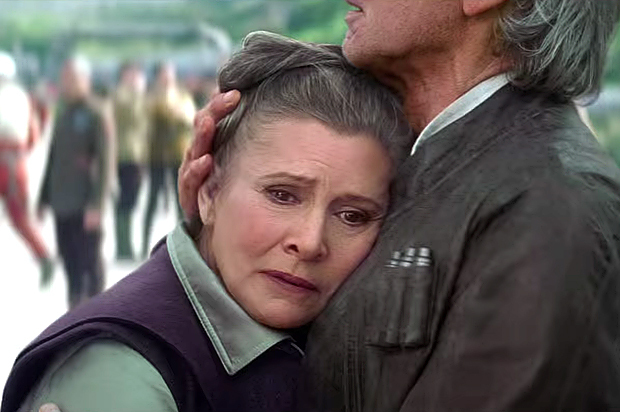 After her death, the first thing that came to my mind is this: when Marc and I watch Star Wars Episode VIII next year, we will be watching it with a heavy heart knowing that we might not see General Leia Organa in Episode IX anymore. It’s not going to be the same after that. However, I will always remember Carrie Fisher as a strong woman who changed the world and the galaxy.